i² (i Squared) is a fully programmable 8-bit computer built of of relays during my final 2 years of high school. It uses over 300 6v relays mounted on boards and has taken in excess of 1900 hours to design and construct. Most of which have been during lunchtimes and after school. 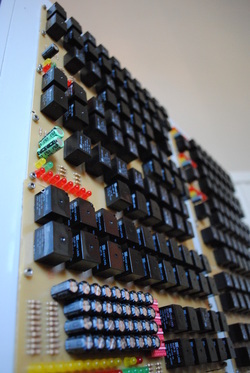 The design draws elements from several other relay computers built by Dr. Harry Porter (RC1) , Jon Stanley (RC2), MCC (RC3) and Fredrik Andersson (Zusie). Throughout the 5 years I have spent at high school I have always been know by everyone there as the boy with the crazy and sometimes dangerous technology projects. i² was one of them. It started during the summer of 2011 I came across the magic of relay based computing after seeing Dr. Porter's Relay Computer video on YouTube. I immediately wanted to know more and after searching for others like his I was hooked. I had to construct my own. The main problem was, as with most things, the cost to buy the necessary relays. They really are not cheap but after many days of searching I managed to find around 300 of them in the old storerooms of school which they later 'graciously' donated (after half of i² was already made). The design phase took about a year and was based on the 300 that I had provisionally acquired. They were however only single and double pole relays which meant a large amount of modifications would have to be made as every other relay computer used mostly 4 pole relays. I decided to go with a modified version of Jon Stanley's instruction set along with a 8-bit address bus and therefore a shortened sequencer. This allowed me to build it with just over 300 so buying the extra needed would not be a huge problem (some of the ones I had were also damaged). I designed some boards to hold them along with a quick frame for mounting and then began the long construction phase. Towards the end I designed a control panel after seeing Fredrik Andersson's amazing one and decided on using Nixie tubes as a decimal output keeping in line with the obscure and outdated technology theme. As of this date it is nearing completion with an estimated date of summer. Rich Electronics - Donated a large amount of relays to complete the project and has a large amount of electronic supplies at very low prices in their eBay store. Please help support this family firm just as they have helped me.